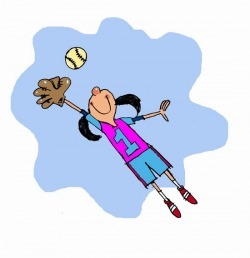 Click on These Links to Improve Your Softball Skills! 3. Learn how to play different positions. 4. Improve basic skills such as hitting and fielding. 1. Practice as much as possible at home. A simple ten minutes of catch or hitting several times a week will work wonders. 2. Arrive at scheduled games 30 minutes early for the pre-game practice and warm-up! 3. Ask a coach if you have any questions about games, playing positions or scheduling. 4. Set a good example by cheering, encouraging, and being respectful to all players, coaches and umpires. As a parent, you play a special role in contributing to the needs and development of your young athlete. deal appropriately with defeat - all while becoming physically fit and healthy. Best of all, they have fun. the outcome of the game! not to impose your own standards and goals on them. Don't put too heavy a burden on your child to win games. out the good things your child accomplished. support for all players, coaches, officials and spectators at every game, practice or other sporting event. Free online concussion training for coaches and parents: Click here. A new Minnesota law requires all coaches and assistants take the concussion training and have the certificate. Parents should also consider taking the course to know the signs and symptoms of concussions and to make good choices about how to deal with concussions. Below are some coaching points that we use. Defense - Defense simply means getting outs. 1. Infielders first job is to get the ball then cover their base. 2. Communicate before and during the play. 3. Outfielders need to expect the ball and back-up the infielders. 4. Always move to the ball and the play. 5. Coach adjusts players because he or she has a different perspective. They will see things that you won’t. Respect the coach by listening without attitude. 6. 2nd base is special base. 2nd basemen and shortstop work together to cover it. 7. If there is no chance of getting an out, get the ball to the pitcher. 8. Defense is an important part of winning the game. 9. The other team and fans will be impressed if you know what the play is and make it. 10. Good defense is fun. 1. Be aggressive - Have the attitude of a "hitter" not a "watcher". 2. Be ready to hit on every pitch. 1. Encourage others when they do something good and even when they make a mistake. 2. Never criticize or complain about a mistake or player. 3. Stay on the field or in the dugout during a game. 4. Always pay attention to the game. 6. Respect officials, players and coaches.